At its core, POOL aims to bring affordable transportation to everyone by putting more people in fewer cars. Last year, we redesigned the POOL experience in Manhattan so that riders walk to the corner for a quicker pickup. That’s because every city is unique and New York is no different. After realizing that a short walk could save people both time and money, we knew we were on to something. Our data was starting to show that we could pick more people up and get riders to their destinations faster. 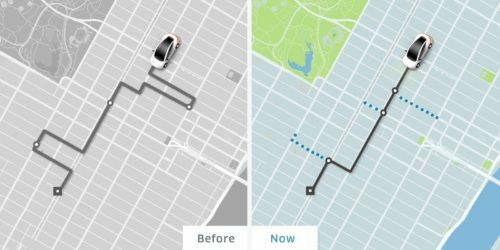 Since then, we’ve been refining our algorithms to create a flexible, affordable carpooling product that is customized for Manhattan. We recognize that POOL is not perfect, so with this latest update, we took feedback from both riders and drivers to focus our efforts on a few key areas: the pickup experience, our matching and routing algorithms, and the drop-off experience. We want pickups to be frictionless for both riders and drivers. This means we must choose the best nearby corner for a rider to walk to: the side of the street and direction matters! For instance, we learned that pickups before the light can be stressful for drivers, especially if they have an upcoming turn. Now we’ll choose a corner that is past the light on the right-hand side. That means drivers can pick up multiple riders along an avenue, and never have to change lanes. And on Avenues like First or Second, we’re also taking into account where there is a bus lane and will avoid picking up there if we can. This not only makes the pickup smoother but also allows us to minimize zigzagging needed to get to future matches. We’ve learned that a positive POOL experience is about more than just speed. It’s about delivering an experience that feels efficient to riders and minimizes stress for drivers. Too many turns or going through a busy part of town can make or break it for both riders and drivers. We’ve improved our algorithm to cut down the number of turns for each mile driven by 20%. We’re also making matches that avoid detours and enable drivers to stay on avenues for more direct routes. We want to keep the POOL system “moving” for everyone in the car. 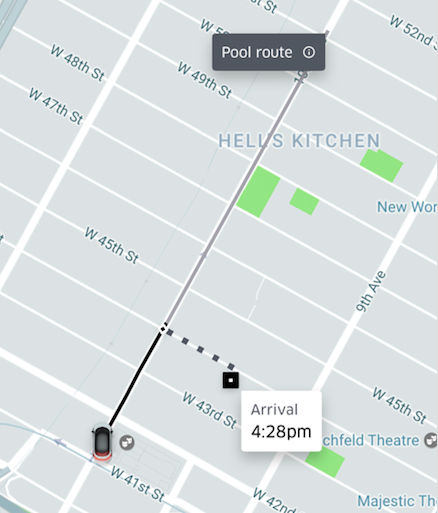 Rather than give riders a drop-off spot right when they request a POOL, we recalculate the best drop-off spot every few seconds when they are nearing their destination. This will also help keep the POOL route as direct as we can for co-riders. While these updates to our technology may individually seem small, when added up they help the system work better together and enable us to deliver a POOL experience that’s much more street smart.